uniforms are acceptable and pleasing to fellow students and faculty. Uniforms reduce financial burdens of a large and varied wardrobe, avoid peer pressures for competitive dress, preclude current dress fads, promote identity and school spirit, and instill the idea of good judgment in dressing properly for the occasion. A standard uniform policy accomplishes these goals. on the parents to use their common sense and good judgment to ensure that their child is properly attired for school and that the attire meets the uniform policy. The ultimate responsibility for a student’s compliance with the uniform policy rests with the parents. 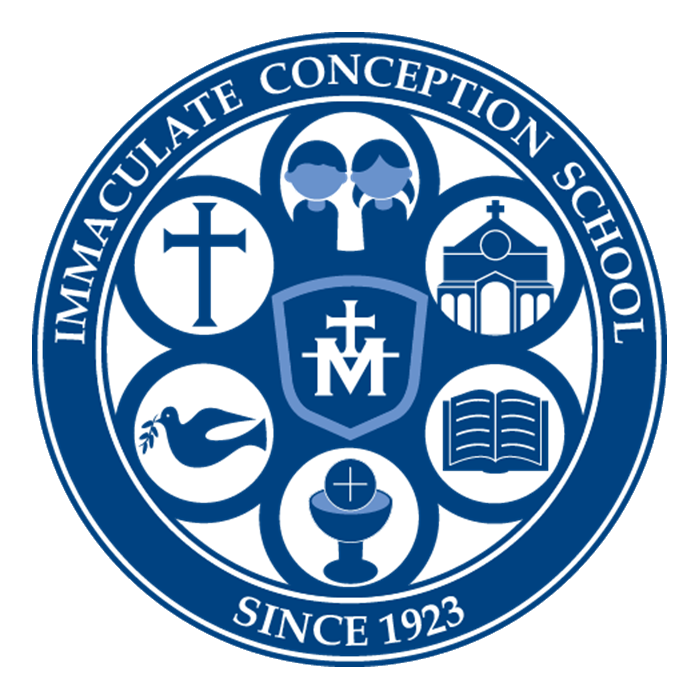 The faculty and staff of Immaculate Conception will enforce the uniform while students are on school grounds and during school related trips. The policy states what attire is permitted under the uniform policy. In other words, if the attire is not set forth below as part of the uniform policy, then the attire is not permitted. faded blue pants, tight-fitting, or extreme styles permitted. button down dress shirt. Shirts must be tucked in at all times. the solid white knit polo or the white oxford button down dress shirt. From October 15th through April 14th boys are to wear a white oxford button down dress shirt and a uniform IC tie. Top button must be buttoned. Ties (7-8) – A monogrammed Immaculate Conception uniform tie is to be worn whenever the white oxford cloth shirt is worn. The knot must be tied to cover the top button of the shirt and the top button must be buttoned. Ties can be purchased from the uniform store. Ties are required from October 15th through April 14th. Jumper / Shirt (K-6) – Blue plaid jumper purchased at a uniform store. The jumper can be no more than two inches above the knees and must be zipped and buttoned at all times. Shirt should be light blue or white knit long or short-sleeved polo, or white or light blue oxford button down dress shirt. Jumper / Shirt (7-8) – Solid navy blue jumpers with the IC Marian Cross logo purchased from a uniform store. The jumper can be no shorter than two inches above the knees and must be zipped and buttoned at all times. Shirt should be white knit long or short-sleeved polo, or white oxford button down dress shirt. Pants (K-8) – Navy blue dress pants, navy blue dress corduroy, no cargo pockets, all pants must be worn at the waist and may not sag. No jeans, faded blue pants, stirrup, tight-fitting or extreme styles permitted. 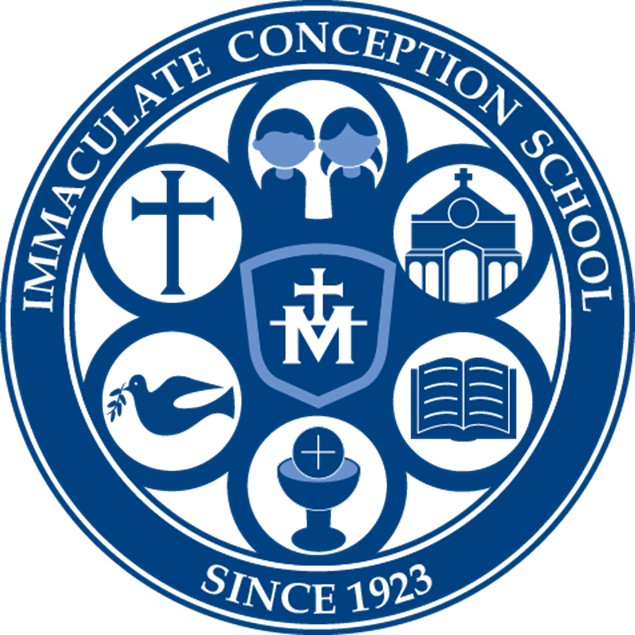 Gym Uniforms: Grades 1-8 will wear a uniform gray T-shirt and navy blue shorts, both with the Marian Cross logo. These uniforms are available at a uniform store. Kindergartners will not be required to wear a gym uniform. Tennis shoes must be worn for gym class. Shoes: Most shoes are permitted. No light-up shoes, sandals, open backed shoes or boots. All laces must be tied. If boots are worn to school, they must be changed upon arrival for the school day. Tennis shoes must be worn for gym class. Socks: Must be solid white, black or navy blue and must be at least 2 in. above the ankle. Solid white, gray or navy blue tights are permitted. Leggings are not permitted. Small logos are permitted on socks as long as they are no larger than the size of a quarter. Sweaters: Optional. Must be navy blue with a v-neck or crew neck. May be cabled or plain knit. May be a pullover, cardigan or vest style. No over-sized, open or decorative weaves. Sweatshirts: Students may wear an approved uniform sweatshirt or fleece jacket with the Marian Cross logo over their uniform during cool weather. Turtlenecks:Permitted during winter months. Must be solid white and worn under the uniform shirt. Belt: A belt must be worn when pants come with belt loops. Belts may be solid black, brown, or navy blue. Undershirts: If worn, must be white and worn under the uniform shirt; sleeves should not be longer than the uniform shirt. Make-up: Make up, colored nail polish, and artificial nails are NOT permitted. Jewelry: One watch, a single religious necklace, and small stud earrings are permitted. No hoops or dangling earrings. Boys may not wear earrings. Hairstyles: Hair must be kept neat, combed, clean, and trimmed. Boys hair should not extend beyond the eyebrows or the top of the collar. Facial hair is not permitted. Tails, braids, feathers, and tinted or dyed hair are not permitted. The judgment of the principal is final in these matters. Scout Uniforms: Boys and girls may wear their scout vest or sash over their school uniform on days on which they have meetings. 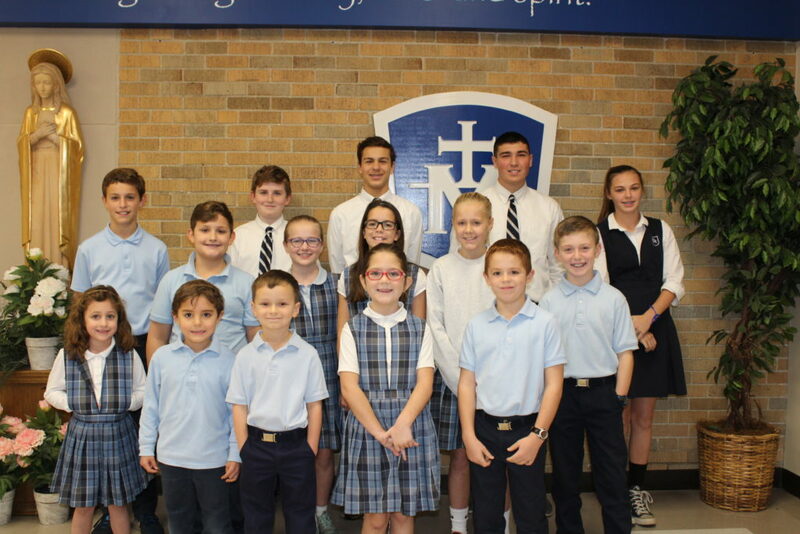 Warm Weather Uniforms: (April 15th through October 14th) During this designated period, students may wear solid navy blue uniform dress shorts. These shorts must be purchased from a uniform store.